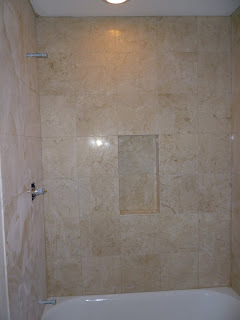 Since the last post, we have torn up our bathroom (OK not us exactly, but our shower re-tiler guys...) We had a leaky valve in the shower, which we had to replace, so as long as we had to do that, we decided to use up the rest of the marble that was left from the floors to re-do the shower. It's still in progress, but it looks amazing! I cannot wait to wash my hair in there! In other news, I hired a wedding planner in Hawaii. She has been great to work with so far, and I can't wait to see what she comes up with for the beach ceremony. Also, I discovered that most airlines & hotel chains offer discounts to wedding guests (yay!!) so stay tuned for more info on that. Jonathan came to LA for a visit, and I think we are zeroing in on the wedding dress design. I am meeting him in Livermore again next month to look at a few more dresses (and taste a few more wines...) So that should be fun fun fun! Check out www.theknot.com/ourwedding/morganlund&tysonyen for more wedding related info.